You can find him in the store by clicking on his name above. Head over to the Catch the Bug blog to see what the rest of the Bugaboo DT wants to show you on this OBG day. You're sure to find some new favorites. 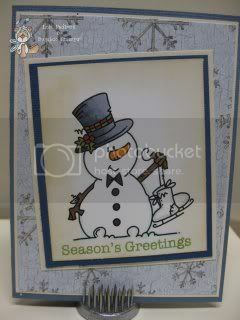 Love this snowman! What amazes me the colors you chose and how well it all fits! I do not have the ability to "see" other colors...I just always go for the typical...like blue..lol! Great job. I have a question for you.....did you make the card holder? I see it a lot and look for it in stores but can never find it! Thank you for sharing!